just southeast of the town, and witnessed by many individuals over the years. The light reached a moderate level of notoriety in the early 1970s, when news of it reached beyond the district to Winnipeg. were rewarded for their patience at about 11:45 p.m. "The wind came up," and the "freight train went by" at this time, portents of the light's coming, according to tradition. Shortly thereafter, a bright white glow appeared straight south of their position. The glow seemed to separate into three pieces, and each chunk "pulsated" slowly. The witnesses' dogs remained frightened until the end of the display, about a few minutes later, when the glows faded. It is worth noting here some of the historical references and traditions of the Woodridge Light. In about 1938, a local resident reportedly named Emil Wischnicki was at a bar in a hotel in the area, drinking with his friends. Somehow, as the story goes, they had a falling‑out, and Emil was left without a ride home. He began walking down the railroad tracks but soon felt weary, and collapsed on the tracks. The train came by, and Emil was decapitated. A few years later, the light was first seen, most often as a bright glow, but sometimes as a ball of light floating around the marsh. Tradition says the light is a lantern held by Emil's ghost as it searches for his head. One person who claims to have seen the Woodridge Light regularly describes it as a ball, 10 to 12 inches in diameter, moving silently down the road from the level crossing to roughly where we were positioned. It is said to disappear suddenly, without a sound, lending an eerie feeling to its passing. In about 1975 or 1976, it was seen by one woman as a "blue ball that hovered on the road." She told us that it was not marsh gas, because it was much larger and brighter than "will‑o'‑the‑wisp." There also exist stories about car engines that wouldn't start when the light appears, and strange noises, like yells, rumblings, squeakings and hammerings that have been reported. Most of these have been attributed to the existence of bats, cougars and woodpeckers in the area. One persistent rumour is that the light appears about the time the train goes by, at about 11:45 p.m. daily. Our observations were at 11:15 p.m., a smidge on the early side, and we noted that nothing was seen at 11:45 p.m. This was true on the other occasions when I traveled to the site to watch for the light. At least one photograph has been taken of the light and appeared in an issue of the Steinbach Carillon on October 27, 1971. Also, local townspeople say than an investigating team from McGill University came to study the light in 1975 or 1976, though I have been unable to verify this. They were said to have taken several photographs, of the light not only appearing, but at one point (so the story goes) perching on the camera itself and burning the film! While some of the lights observed are probably car lights, the appearance of the smaller balls is a mystery. In 1975, local resident Gary Auch was waiting for the light to appear one night, and happened to look in his read‑view mirror. He was shocked to see it "sitting on the trunk of the car, moving slowly up and down." The light was not bright, but coldly illuminated, like day‑glow paint. Are "spook lights" related to UFOs? As they are often reported as UFOs and share some of the same characteristics. Or are they a "paranormal" phenomenon (making UFO reports a "normal" phenomenon)? I've been receiving many UFO reports during this month - far too many to enter into the database promptly. a bright white light hovering over Mt. St. Hilaire, which is South East of Montreal, at 4AM EDT today (Oct 22). The light remained there for 15-20 minutes and then disappeared. I spoke with the witness, which was interesting because he doesn't speak much English and I don't speak much French, but I got a few more details. First, he says it occurred at 6 am on October 22, 2012, not 4 am. He says it was definitely not an airplane, and it was not moving. He and his wife live on the 4th floor of an apartment building, and they face Mont-Ste-Hilaire to the east. The object was fairly low, but just above the mountain. He says it simply vanished at the end of the observation. He also notes that he saw it again two days later, in the exact same location, but that it was cloudy the past few days and never saw anything. My first thought was that it was astronomical, so I checked star charts and found that Venus was exactly in the right location. The witness also said that there were two "rays" coming out of the object, which went from south to north. It was difficult for him to describe their appearance. Anyway, it's probable that Venus was in fact the culprit, although its disappearance after 20 minutes is a bit problematic. But this case is about average in information content as far as recent cases go. Not a lot of detail, lots of missing information, but most are starlike in appearance. And there are hundreds of these reports each month. At Paracon on October 12 and 13, 2012, I had a chance to sit and talk with Roswell UFO proponent Stanton Friedman several times. he agreed to let me post a short Youtube clip of new asking him a few questions. Basically, after all these years, why does he still doggedly believe there is a cover-up, and is there anything left to learn about Roswell? A reporter asked me recently to describe the best UFO case that had ever occurred in Western Manitoba. And that made me rack my brain somewhat. We’ve had many interesting and significant cases in South-Central Manitoba (e.g. Charlie Redstar around Carman) and around Winnipeg (e.g. the Charleswood “landing”) and Eastern Manitoba (e.g. Falcon Lake) and Northern Manitoba (e.g. the Thompson “abduction” of Miss LeMarquands). But Westman? 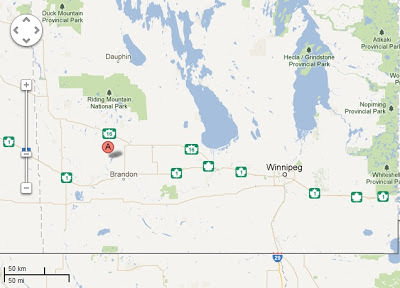 The most curious Westman event that came to mind was the incident at Rivers, Manitoba, in 1967. It involved multiple witnesses, many of whom were military personnel, plus alleged physical effects and traces. Furthermore, it's a case that is rarely mentioned, yet has many elements of a classic of ufology. 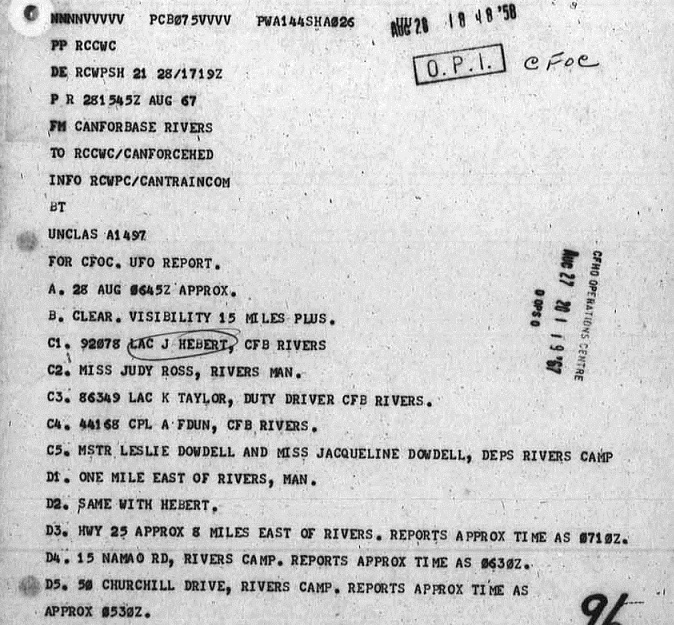 The report, in the National Archives, notes that the incident occurred at 0645Z (12:45 am) on August 28, 1967. There were six witnesses, three of whom were military personnel: LAC J. Hebert, LAC K. Taylor and CPL A Fedun, all stationed at CFB Rivers, plus civilians Judy Ross, Leslie Dowdell and Jacqueline Dowdell, all of Rivers. Hebert and Ross were driving one mile east of Rivers, Taylor was 8 miles east, Fedun was in the town, and the Dowdells were at a different location in the town. In other words, we have six observers scattered across four different locations. At 0645Z, G. Stefanson, a Commissionaire, reported hearing a loud noise similar to what McArthur would report later. The first problem to deal with is the discrepancy with regard to the differing times of observation. Even if we assume the Dowdells' time of observation is an hour out, there's still the matter of reconciling 0630Z to 0710Z, at least half an hour. It's reasonable to assume that the military observers would be accurate in their times, so it seems possible there was more than one object seen. More on this later. LAC Heberts car detained at ME section. Body repairman states light dust on top of car is unlike any other in his experience. There is some bubbling of paint on top. This incident reported to TCHQ by base duty officer. TCHQ investigating team scheduled to arrive Rivers 1200 hours this date. There are a number of things to note here. First, Hebert's report was taken seriously enough that they impounded his car as evidence. Second, the military vehicle repairman noted there was an odd dust on the car and bubbling of paint on the roof. Third, this was considered such a significant case that "TCHQ" - the RCAF Training Command Headquarters in Winnipeg sent a team to investigate. This team was the Canadian equivalent of the USAF Project Blue Book. In other words, they were immediately dispatched to the scene. 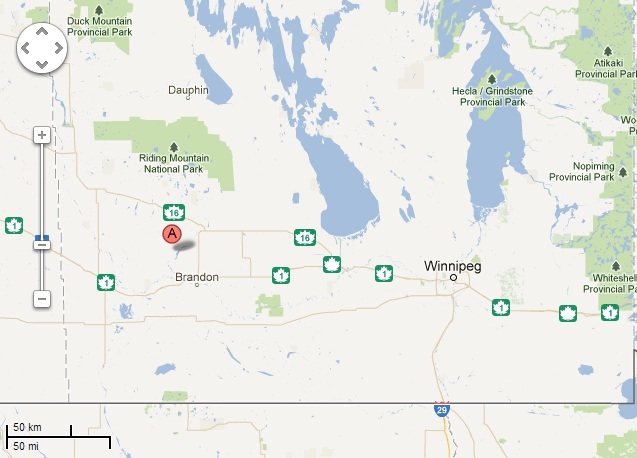 Since Rivers is about four hours' drive from Winnipeg, if they were to arrive by noon, they would have to have left Winnipeg no later than about 0800 hours, or within the hour that the sightings were reported to CFB Rivers. They had to have been roused in the wee hours of the morning, packed into a military transport and driven out. This also says something about the team. To have been essentially at the ready, they would have to have been identified as a team and prepared for "action." Even arranging a transport at short notice is impressive in itself. Of course, the makeup of the team and its readiness is not completely surprising. August 1967 was just three months after the Falcon Lake incident in Manitoba, only about 400 kilometres to the east of Rivers. It's sensible, then, that Squadron Leader Paul Bissky of CFB Winnipeg was part of the investigation team. Bissky was a devout skeptic; in an official document about the Falcon Lake case, he described how he attempted to get UFO witness Stefan Michalak drunk at the Falcon Lake hotel bar in order to break his story about being burned by a flying saucer. As for the other two team members, they don't seem to have popped up anywhere else. In addition to the available documents, we know that there were two telephone conversations between both the CFB Rivers commander and Bissky with Wing Commander D. F. Robertson at Canadian Forces Headquarters in Ottawa. Roberston was also involved in the Falcon Lake case and received all materials relating to that case investigation as well. D. Dust on car appeared to be ordinary western Canadian dust and which more than likely was picked up while in the gravel pit and travelling to and from Rivers. F. Suspect sightings were of a falling meteorite which may have fallen in the Rivers vicinity. Have advised Prof. Leith office, U of Man, in accordance with CFAO71-1. Prof Leith away on vacation and will not be back for one week. No further action contemplated on this case at this time. So the team drove out all the way to Rivers but did only a "short investigation." They did only a visual inspection of the dust on the car, without taking any samples for laboratory analyses. Their opinion outweighed that of the carpool jockey, who had certainly seen gravel dust before, as CFB Rivers was only a few miles from a gravel pit. And what had happened to the blistered paint? But notice what they did test for: radiation and magnetism. Why? What protocols would have dictated such tests? The answer might have something to do with both the Falcon Lake UFO case, which had taken place earlier that year. At the Falcon Lake site in Eastern Manitoba, higher-than-normal levels of radioactivity had indeed been detected at the site, so there was a precedent for expecting radiation. This also was the reference to the "white blood cell count," which was reportedly abnormal in the blood of the Falcon Lake UFO witness. But why check for a change in the magnetic field? Civilian UFO investigators had been claiming that such effects were common in cases where UFOs were said to have approached cars, but would this have necessarily been translated into operating protocol for military UFO investigations? There is no record of Hebert being examined by the base physician. And isn't it odd that Hebert's companion, Miss Ross, was not similarly tested? Regardless, Bissky and his team decided that the case was nothing more than a falling "meteorite" (NB - "meteor"). Ed Leith was a geologist at the University of Manitoba whose expertise included meteoritics, and he was the National Research Council of Canada representative in Winnipeg. Leith was known to be a skeptic and debunker of UFOs as well. The meteor explanation is viable for the observations of the fireballs with tails passing from SW to the NE. The 30-second duration of the light above the car isn't compatible with meteors or bolides, although UFO witnesses' perception of duration has been suggested to be often in error. But Ross said the light seemed to have been stationary, too. It would have been useful to get more testimony from her as well, since her observation was somewhat different from that of her companion. 1. Attached refers to UFO report from Rivers discussed W/c Robertson 29 Aug.
2. Cantraincom elected, on their own initiative, to conduct a fast investigation into subject UFO reports. Their report is attached. 3. Para H of subject UFO report would appear to be answered by investigation report. 4. Does it appear to be a fireball? The paragraph in question seems to have been about Hebert's car and the dust that was found and then not found. So according to this memo, the TCHQ UFO investigation team chose to "on their own initiative," conduct a less than thorough investigation of the incident. They didn't interview witnesses in detail, didn't arrange testing of any samples from the car and didn't try to establish a definitive timeline of events. 1. Reference UFO Report Rivers, Man. 2. The actual sighting reports conform with the appearance of a fireball, and the two observations of "explosion" noises not only fit the fireball pattern, but suggest a good probability that some of the incoming material would reach the ground! 3. The only important confusion is the reported time - 5:30 to 7:10 AM. If the times are reliable, we have another coincident meteor or UFOs. Quite possibly the times are guesses - this might be checked. 4. Prof Leith can take up the fireball investigation. 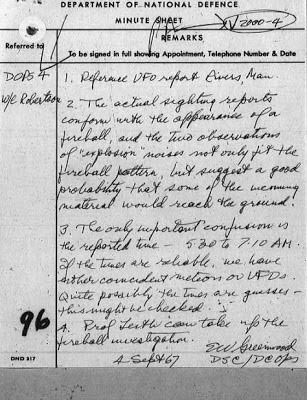 According to this, the final document in the case file, the incident was solved as a fireball/bolide event, even though the observations did not completely fit the explanation. Robertson even acknowledges that the time differences might suggest that two objects were involved. Were there two brilliant meteors an hour apart? One fireball and something else? And was Hebert's estimate of duration of the event radically in error? And what, exactly, did he see? A brilliant, slow-moving object, or simply a bright flash that he assumed lingered because of a sudden shift in night vision adaptation? And, if the meteor explanation was valid, what of the "explosion" that rattled windows? It is rare for witnesses to hear the sonic booms of fireballs, as most are high in the atmosphere, even those that explode or fragment. But meteor sounds have been acknowledged as real, electrophonic phenomena, though the theory of their production is "controversial." (See: http://www.pibburns.com/catastro/metsound.htm) Whether or not Leith investigated or tried to locate pieces of the meteorite through a ground search is not known. Finally, a note about "disclosure." The official documents from the National Archives regarding the Canadian Forces UFO file on this case are available online through the relatively recent "release" of scanned documents now available online through the Canadian government. Some have said that the sudden availability of these files is an indication of worldwide government disclosure of UFO documents. The reality is that I had these documents already in my possession more than 30 years ago, when I simply requested a microfilm copy of the National Research Council files through my own local library, then painstakingly (and expensively) microcopied the relevant pages as hard copy printouts. They are faded now and hard to read, but they are the same documents. 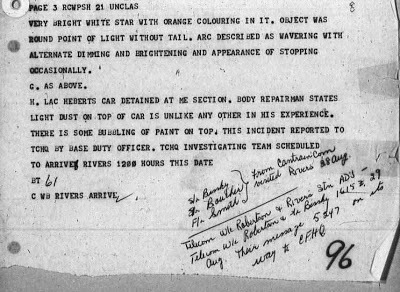 The Rivers, Manitoba, case of August 28, 1967, gives some insight into how UFO reports were investigated by the Canadian military. It is especially noteworthy because it involves multiple witness, military witnesses, and alleged physical and physiological effects. It remains a curious case, although evidence suggests that at least some witnesses' observations were those of a bright, fragmenting fireball. It is too bad that it wasn't more thoroughly investigated. UFO reports continue to pile up. 2012 is on track to be another plateau year of several hundred cases again. I received a memo today through Transport Canada regarding "3 sightings of lights" that were all "in vicinity of" Sioux Lookout, Ontario. The memo isn't clear, but apparently personnel on three different aircraft flying at about 36,000 ft. saw: 1) a light like a shooting star; 2) an odd light on the ground; and 3) a light above the aircraft. According to the memo, all three sightings took place at 1850 hrs local on October 8, 2012. A week ago, I had been in Neepawa, Manitoba, for a writers' event in Margaret Laurence House, and casually glanced through a copy of the Neepawa Press, the local paper. In its version of a "Police Blotter," the "Cops Corner" noted very simply: "a driver reported a UFO sighting. Members were unable to confirm." The date on the newspaper was September 26, 2012, on page 7. Then, I received a Facebook message from a friend who tipped me off to something that happened in Portage la Prairie, Manitoba on Saturday, September 29, 2012. The story was that 5 (five) police cars responded to a call from a resident who reported seeing a bright light high in the eastern sky. When I phoned the witness, he confirmed that several police showed up, and they watched the UFO with him. In their opinion, they told him it was nothing but "Saturn." Now, that would have been odd, since Saturn isn't up at 4:30 am when this was observed. But Jupiter was, exactly in the right spot. Furthermore, the witness said he saw it on consecutive nights in the same part of the sky, which pretty much nails it. Finally, completing the quad of Manitoba news, I learned that a Hollywood-style movie has been made concerning the famous Falcon Lake case. Well, it had to happen, sooner or later. The movie was "inspired by" the Falcon Lake UFO case of 1967. It's titled Rulers of Darkness, and has already been filmed, and awaiting distribution. The producer asked me if Winnipeg would be a good site for the world premiere. I say yes. But hey, it's a movie about a UFO case in Manitoba.